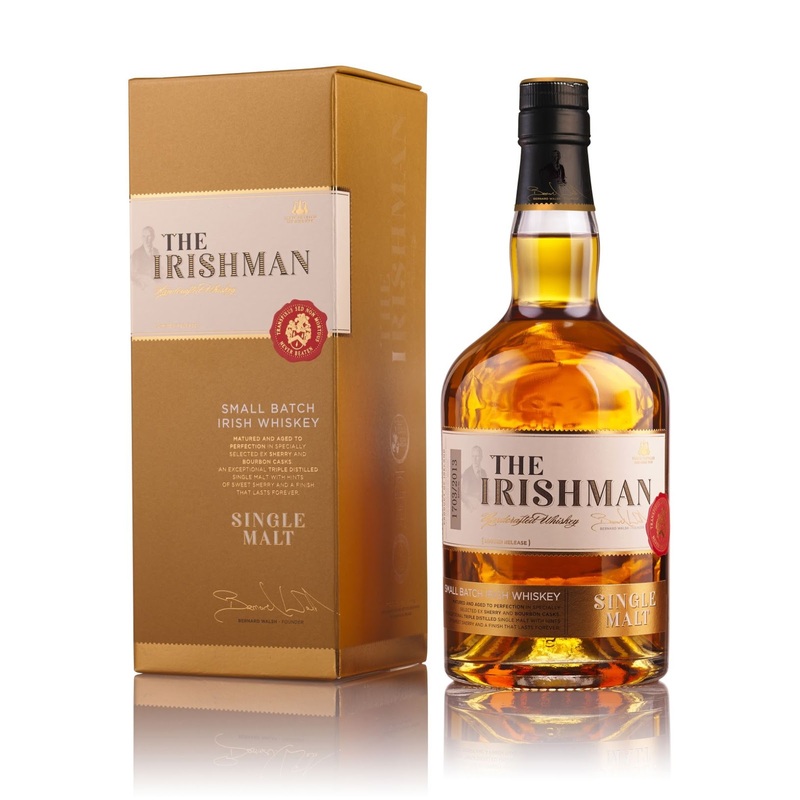 As I write, Bernard Walsh and Shane Fitzharris of The Irishman Whiskey are at Vinexpo in Bordeaux, launching a new look, and a new whiskey. 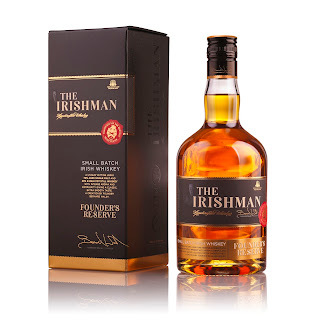 The Irishman 70 is now The Irishman Founder's Reserve. There should be no more debates about the composition of this whiskey since it's now clearly written on the label: "70% aged single malt and 30% single pot still whiskey". Fragrant notes of green apple and honey give way to pot still spice and summer fruits with a deep finish fading into spiced oak and butterscotch. The Irishman Single Malt remains. It never had a prominent age statement though it used to say in the small print that it was aged for over a decade. It doesn't say that on the label now but it's still a combination of triple-distilled malt aged in sherry and bourbon casks. Toffee and vanilla give way to toasted almonds, honey and floral aromas with a long, decadent finish enhanced with oak and dark chocolate. 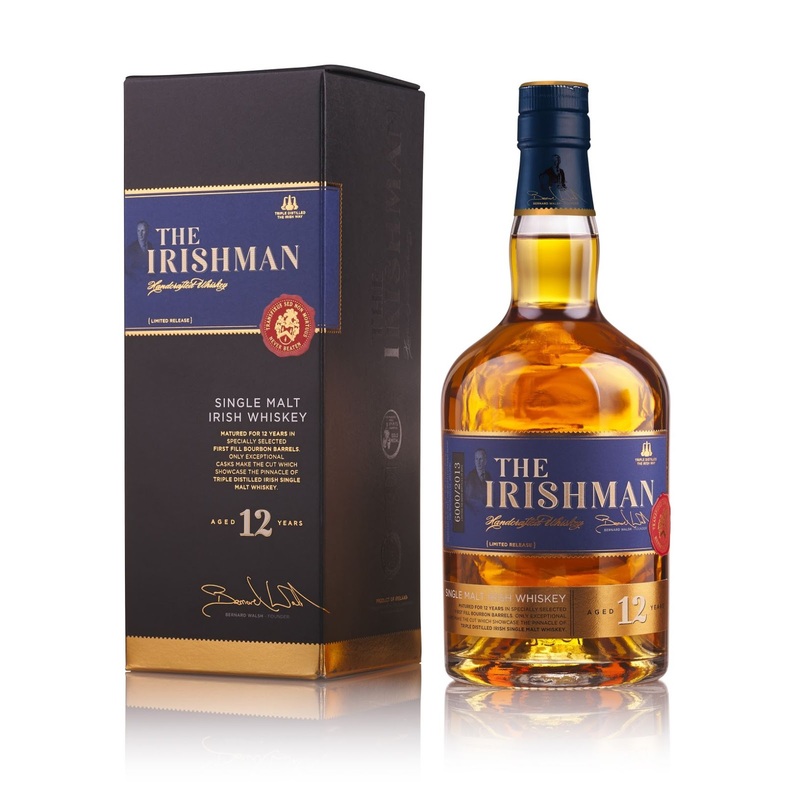 And then there is the new Irishman Single Malt, 12 Year Old. This is all first-fill bourbon cask and bottled at 43%. It's limited to 6,000 bottles. The influence of 1st fill bourbon cask gives a light sweet spicy note of vanilla, cinnamon and even a tincture of clove. The initial sip is a burst of rich flavours, sweet with vanilla and delicately bolstered by black peppercorns. This gently gives way to succulent fruits leaving behind a lingering flavour of grassy cereal notes. There was a preview of this 12 year old late last year. It had a similar profile but, of course, was a distinct and much smaller batch. Following extensive work with London & New York based The Futures Company the brand took to the streets in New York, Hamburg and Seoul, for in-depth reviews and focus groups. From this the message of "Making it Personal" has become the heart of the brand positioning of The Irishman. The objective was to elevate The Irishman brand identity to compete in design and image with the world's greatest whiskeys while conveying the ethos of using craft distillation and quality ingredients to produce the smoothest of award winning whiskeys. Shane tells me that the new branding will be exclusively available in duty free in Ireland for the month of July and will hit domestic retail (the Celtic Whiskey Shop, etc) on August 5th, by which time they also hope to have a new Cask Strength release.